Attracting Investment, so that mixed housing delivery can be independent of market conditions. Update comment: Great to see that this LGC article is currently “Managers Choice” on the HCA Linkedin group. 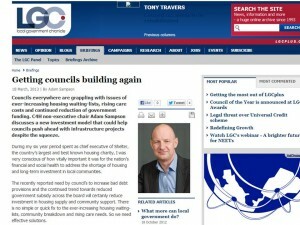 “Getting Councils Building Again” (Picture link). Councils everywhere are grappling with issues of ever-increasing housing waiting-lists, rising care costs and continued reduction of government funding. C4H non-executive chair Adam Sampson discusses a new investment model that could help councils push ahead with infrastructure projects despite the squeeze. During my six year period spent as chief executive of Shelter, the country’s largest and best known housing charity, I was very conscious of how vitally important it was for the nation’s financial and social health to address the shortage of housing and long-term investment in local communities. The recently reported need by council’s to increase bad debt provisions and the continued trend towards reduced government subsidy across the board will certainly reduce investment in housing supply and community support. There is no simple or quick fix to the ever-increasing housing waiting-lists, community breakdown and rising care needs. So we need effective solutions. New ‘multi-faceted’ solutions are obviously needed for the positive side of this changing real-world equation, and Community Interest Company (CIC) solutions have a role to play, and more particularly our developer CIC and property trust investment combination I feel, can make a real difference. Our CIC solution is designed, primarily to attract pension fund investment but also to act as a catalyst for build and social good, all largely independent of prevailing market conditions. Overcoming the recognised investment inertia from a “boom bust” property market, via an attractive low risk, yet high yielding fund therefore, is our key enabling factor. We applaud the varied and innovative new financing solutions being tried to get “Britain Building”, but they are to date, relatively small scale or are having limited impact; more ambitious ideas of increasing supply via PRS investment (for profit or not for profit models), REIT possibilities, or Sale and Leaseback mechanisms are all hampered by the traditional mix of viability, scalability, high risks and low return issues. Historically the government has contributed over £80bn+ over the last 20 years to assist housing delivery and more recently looked to apply increasingly meagre S106 commitments; housing delivery viability simply does not work. Add to this the banking sectors retreat from long term investment, persistent poor market conditions (leaving in its wake a long list of insolvent past investors) and a growing gap in the affordability of owning your own home and anyone can see that to attract investment a different mindset is required. Our CIC solution resolves what we believe to be the two vital issues not being addressed in combination by any other solution to date. To address viability, we allow our related Property Trust (CIC-PT) to retain the profit created from development. To provide yield confidence we combine the traditional loans required for the social and private homes so that lower risk, lower return but secure incomes from Registered Provider (RP) bond equivalents for the social homes effectively underwrite the higher risk associated with market exposure to PRS and long term sales. We are working with a number of RPs and councils to identify large consented sites (200+ homes) that offer the opportunity to build a mixture of social and private homes. Each investment will seek to maximise the proportion of social and affordable housing as this is where any investor will seek to increase yield surety. As a CIC, Catalyst for Homes CIC is not seeking to extract the development profit for its work but subject to minimum investor returns, to reinvest the retained surplus held by CIC-PT back into local community investment and social enterprise. The custom of constraining a developer’s community commitment to that defined in a S106 when planning is consented, whilst providing surety for the developer does not recognise the changing needs of each new community. The combined effects of unforeseen changing community need and support along with inadequate design are borne out by so many failed communities. Changing the traditional delivery approach where LAs and society as a whole end up dealing with the long term consequences of the developer’s short term financial involvement, only being responsible for that defined in a S106, into a long term participation for all parties, changes the focus towards making communities work, in a fluid and thriving environment. Our CIC, without subsidy business led solution, we believe contributes towards a rebalancing of the new community equation increasing housing supply, tackling housing waiting lists, whilst recycling the traditional development profit into providing apprenticeships, jobs, local care and long-term economic growth.